The pie chart shown here should look familiar by now. We’ve already talked at length about the big slices of the pie – heating and cooling. Now it’s time to move on to lighting, shown here as 12% of the typical household energy usage. In my experience with real homes occupied by living, breathing families, that 12% number may considerably underestimate the actual energy consumed. I’m sure that I’m biased because in my area, there are lots of large homes with modern amenities like ceilings filled with recessed lighting. Fortunately, this is one area where homeowners can easily assess their own energy use and take actions that immediately reduce their energy use. I have a good friend who moved into a new house. After the first few months of living there, he was about ready to move out because his monthly electric bill was averaging around $750! Fortunately, being a good engineer, he quickly noticed that this house was well lit – very well lit! There were dozens of recessed lights on each floor of this home. And with two children active at home, most of these lights were on all waking hours. At first, he would follow the family around, grumbling as he turned off light switches. But this was a losing battle. He simply could not keep up with this round the clock. It was frustrating to him and annoying to his family. What to do? My friend decided to start changing light bulbs. Week by week, he replaced the high usage lights with high quality compact fluorescent bulbs, each using about one quarter of the energy of the original bulbs. Pretty soon he had a box of old 90w flood lights, replaced by 23w CFLs. He was happy knowing that the house was still well lit and safe for his family but every bulb saved 67w. He also was glad not to have to replace the bulbs as often because his home has high ceilings making changing bulbs inconvenient. While this was an extreme example, it is a real one. Light bulbs do make a difference – the more you have, the greater the potential savings. I’m not going to argue about the pros and cons of compact fluorescent bulbs. There are more than enough sites that discuss mercury. Instead, I’m going to show you how much energy you can save and teach you how to prioritize bulb replacement. Spend a week just paying attention to how the lights are used in your home. Which lights are left on all day? Which to you tend to turn on and off frequently? Do you have outdoor “safety” lights that stay on all night? Are there lights where the “color” is particularly important (like above a dressing table)? I highly recommend keeping a notebook where you log each area of the house, how many bulbs there are, the wattage of those bulbs, and the number of hours they are on each day. This will make your job even easier later one. If you’re not familiar with spreadsheets, this is the time to learn. Plug your list into a neat spreadsheet and you’ll be able to do all these calculations really easily and then automatically sort the list by watt-hour consumption figures. Assuming that you want to keep the light output from the bulbs the same, find appropriate high efficiency replacement bulbs and start replacing lights! I highly recommend checking out the EFI Store. I’ve been buying most of my energy efficient lights, fixtures, etc. from them for years and they’re amazing. Their entire business is built around helping people save energy. And, they sell quality products unlike the “big-box” stores that sell a lot of poor quality items. I mentioned earlier that there are some fixtures, like above a make-up table, where you might not want to change the bulb to a CFL because color quality is important. I don’t want to sound sexist, but there’s no way around it – if you have a place where you or your spouse puts on makeup or gets dressed, don’t use CFLs. 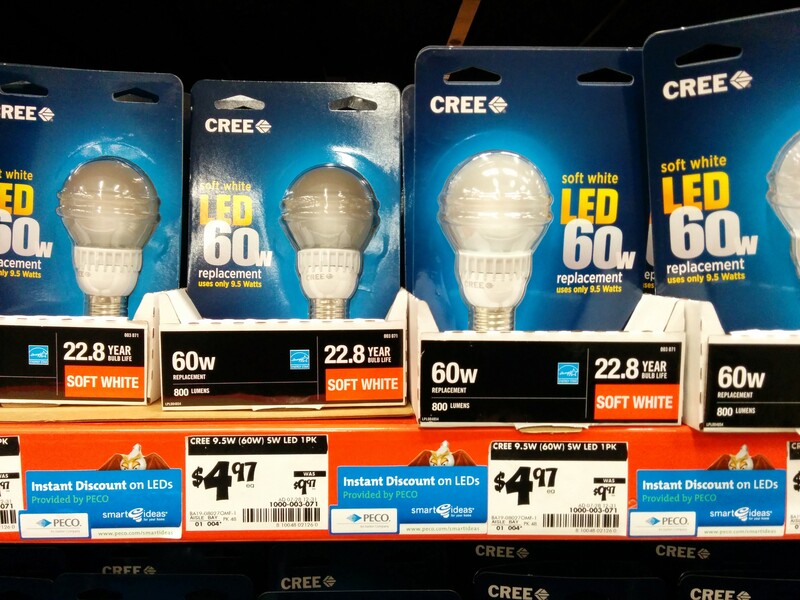 Most modern CFLs don’t have the color quality needed for this critical need. However, some of the LED lamps, like the CREE units sold by EFI, do provide excellent light quality. LED bulbs are expensive, there’s no way around that. However, in high use areas, they can pay for themselves in a few years. They also last forever (25,000-50,000 hours) so there’s a good chance that you’ll never have to replace them. Do not use fluorescent bulbs in areas where they’ll be on for short periods. The life of a fluorescent bulb decreases the more often it is switched on and off. So a bulb rated for 5,000 hours of life might only last 2,000 hours if flipped on and off frequently. Fluorescent bulbs are best suited for those areas where they’re left on for hours at a time, such as living space lights or outdoor safety lighting. Fluorescent bulbs take a long time to warm up in cold weather, making them inappropriate for outdoor lighting that must come on quickly. For example, if you have motion sensors, this is not an appropriate place for fluorescent lights. However, this is a good place for LED lights since they come on to full brightness immediately. On the other hand, I use 13w CFL bulbs in my outside post lights that I have on a timer to come on at sunset and turn off a few hours later. They’re perfect for this application. Remember the spreadsheet I had you to make earlier? Well, now’s the time to look at it more carefully. The example of outdoor lighting I walked through showed that those outdoor bulbs use 9,600 watt-hours per day. Divide that by 1,000 to get the kilo-watt hours of use per day. In this case, 9.6. Electricity is sold by kWh, so this lets you easily compute the cost. You’ll want to look at the rating of the bulb you buy to replace the inefficient one and do the calculations again. For example, if you replaced those outdoor lights with 23 watt CFL bulbs, the calculation is: 23 x 8 x 12 = 2,208. Now, subtract this from the original to get the daily savings: 9,600 – 2,208 = 7,392 or 7.392 kWh per day. And, determine your real electric cost per kWh. Do this by looking at your total electric bill and dividing the cost by the total kWh on the bill. This will include all charges for generation, transmission, taxes, etc. and will give you a rough true cost of electricity. For example, if your utility bill was $200 and you used 1,500 kWh, your cost per kWh is: $200/1,500 kWh = $0.133/kWh. Finally, multiply these numbers together to get the yearly savings: 2,698 * $0.133 = $360. So there’s a complete and realistic example – replacing eight 100w bulbs that are on for twelve hours a day can save $360 per year, assuming you’re paying 13 cents per kilowatt hour. This is pretty typical. Add up your savings for all your fixtures and you can see how significant the savings can be. As noted throughout this post, EFI.org is the place I buy my high efficiency lights. Yes, if you click through these links, I’m part of their affiliate program, so I profit from your purchases. But that’s not why I recommend them. I recommend them because they’ve devoted their lives to helping consumers live more efficiently. They’re not some Johnny-come-lately store that’s just doing it because it’s the latest trend. Check out their blog and “about” pages and you’ll see. They deserve our support.